Featuring speeds as fast as 250 ?s and a sensing range up to 300 mm, the Q3X is ideal for high-speed packaging and detection applications of small targets, such as registration marks on packaging, or verifying placement of black gaskets and O-rings on machined metal parts. 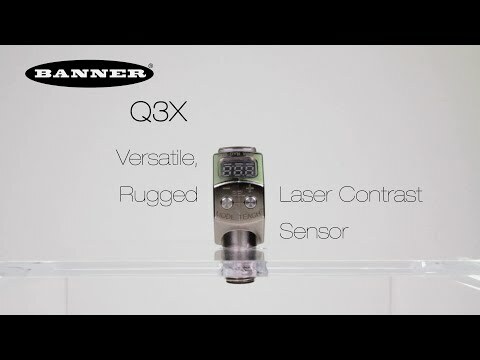 Featuring a unique angled, three-digit display of signal intensity, the Q3X provides high visibility of operating conditions from multiple angles. For an intuitive user setup, the Q3X has two tactile buttons conveniently located below the display. Designed with robust nickel-plated zinc die cast housing, the Q3X provides superior performance, even in environments with exposure to cutting fluids and oils. Sensors are also rated to IP67, IP68 and IP69K for enhanced protection to water submergence and high-pressure washdown.